The sari or saree is as old as the Indian civilization. Cotton weaving was known to the inhabitants of the Indus Valley civilization some 5000 years ago. There is mention of sari in the Vedas and Mahabharat establishing the origin and age of sari.It is an unsewn cloth draped around the female body and is 4 to 9 metre in length. Though sari is worn by women in various style, the most common being wrapping one end around the waist and the other end covering the upper body leaving the midriff. Men also wear cloth similar to sari and is known as ‘dhoti’ or ‘lungi’. Sari in primarily worn only in the Indian sub-continent. The different colours and designs are symbolic and vary from region to region. The colours also vary according to the occasion on which the same is worn. The saris were initially weaved out of cotton and silk yarn only but the Europeans introduced synthetic polyester and nylon, weaved on power looms and were cheap. 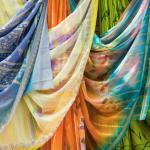 The handmade saris are made out of cotton and silk and blends. Metallic threads, also of gold and silver are also used to form intricate designs. Sari is the national dress of India. Poornakumbham saris are the fine cotton textured saris which are woven with rudraksha motifs highlighted with pearls or neuththu and cross lines. These saris are plain or striped and generally are weaved on 80- count yarn. Dhaniakali saris are long lasting and does not require any kind of special care.